I came across this review yesterday. 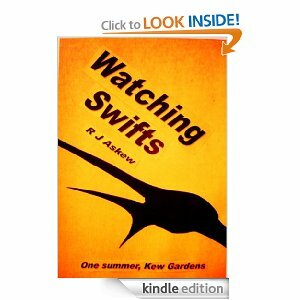 Ron Askew is an old friend of mine from Authonomy days, and Watching Swifts is my favourite modern piece of poetic prose. I’ve read it and re-read it, and it lies permanently stored on my kindle. Lucy’s review prompted me to contact Ron again – I’m delighted to announce that he will be featured on my blog in August. Meanwhile, if you havent read Watching Swifts, and even if you dont really like cities (like me), you will love this evocative piece set in the middle of London. This book is one of those that keeps popping back in your mind. Prose and verse, or verse written as prose entwined with verse. I was drawn into the mind and world of the swift man. This author has the rare ability to capture his reader with a form of prose which keeps you wanting more. I had to know what happened with him, his antagonist (the female photographer he’s talking to) and the swifts. Yes, the swifts, those lovely birds, the harbingers of summer and hope for better times. When things ended different from any ‘regular’ novel would I was actually glad. I felt happy for the swift man, the swift, and the gardener, I felt sorry for the photographer who inadvertently lost her chance of life anew. Or had she?